Which Are the Continent's Wealthiest Cities? 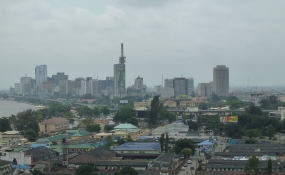 Lagos is among the 10 cheapest cities in the world, according to a survey by the Economist Intelligence Unit. Caracas (Venezuela) occupies the first position, followed by Damascus (Syria), Tashkent (Uzbekistan), Almaty (Kazakhstan) and Bangalore (India) in second, third, fourth and fifth position respectively. Karachi (Pakistan) and Lagos (Nigeria) occupy the sixth position while Buenos Aires (Argentina) and Chennai (India) share the seventh position. New Delhi (India) is the eighth on the list. The survey, which compares the cost of 160 items, such as food, drink, transport, utility bills, and rent, in 133 cities, also listed Paris (France), Hong Kong and Singapore at the top of world’s most expensive cities. They are followed by Zurich (Switzerland) fourth; Geneva (Switzerland) and Osaka (Japan) fifth; Seoul (South Korea), Copenhagen (Denmark) and New York (US) occupy the seventh position while Tel Aviv (Israel) and Los Angeles (US) share the 10th position. The annual index, according to the BBC, was designed to help companies calculate cost-of-living expenses for expatriates and business travellers. The Economist Intelligence Unit noted that costs in the cheapest cities were low by Western standards, partly because low wages limiting household spending are the norm there.